I have almost the eaxact same floorplan as you. Other than a full porch and a (later added) mudroom, we are faternal twins. Love bungalows! Best of luck! I’d love to see pictures if you are willing to share! Hi IBB! Just found your blog today & love your little house. 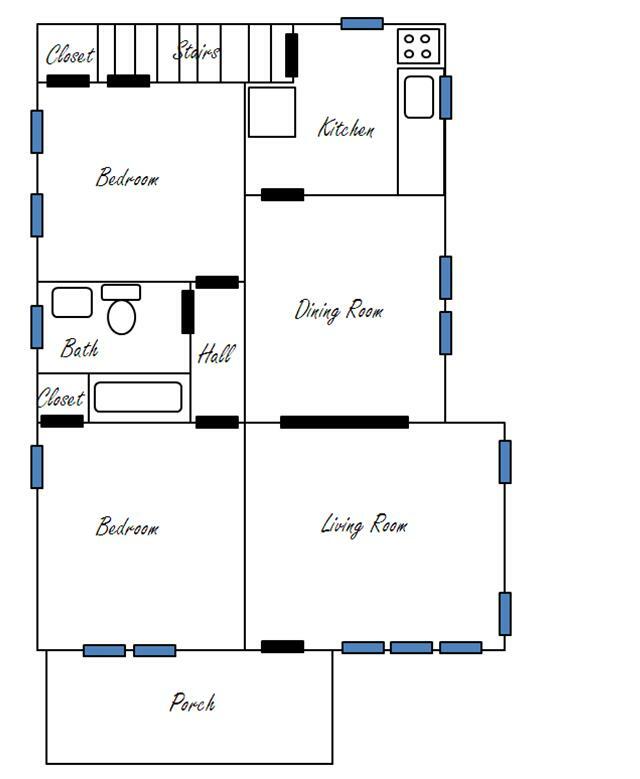 We have a similar floor plan in our tiny 1920’s bungalow that we’re DIY renovating & blogging about. Also recently started a site dedicated entirely to house blogs (www.bluedoorblogs.com) would love to add your blog to the reading list! Hi there! Just letting you know that I admire your blog and home. We moved into a super old rental house this spring, with basically the same downstairs layout as yours, and I found your site looking for inspiration for gray porch trim. 🙂 Since we’re renting, we’re not investing in all of the awesome projects you are, but the owner gave us free reign to re-paint and decorate so I love seeing all of the inspiring work you do! Thanks for sharing. Thanks Ashley! I was just looking at the pictures of your place on your blog and noticed how much alike our houses are too. I saw the old ironing board closet in your kitchen and wanted to tell you that when I removed the wallpaper from my kitchen there were witness marks from what I believe to be an ironing board closet much like yours. Funny how much in common things are. Wow. Our chicago bungalow has an almost identical layout ! We are planning to blow out the wall between the kitchen and dining room to give to house an open floor plan. I also love you chambers stove ! I grew up with one. We plan to find one to refurbish too any tips or a post about that would be awesome !! Your blog is lovely. Thanks! I’ve also thought about removing that wall. I go back and fourth about it though. I’m afraid I’ll miss the formality of the dinning room but from a practical standpoint it makes more sense because I could have a countertop there which I desperately need!